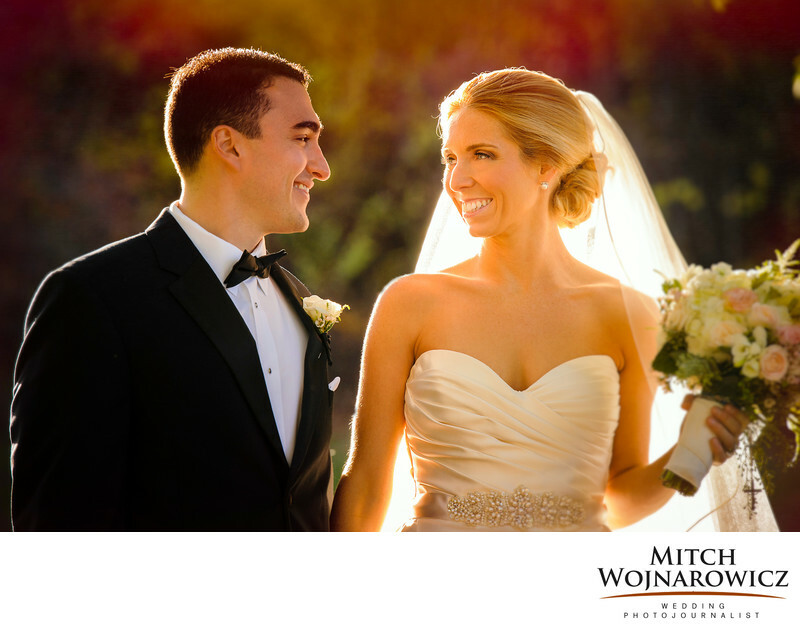 As one of the best wedding photographers Saratoga NY, I take advantage of great moments and great light. The warm sunshine at Julianna and Andrew’s fall Canfield Casino Saratoga wedding streamed through the trees as we took wedding photos in Congress Park. I took them aside for a few minutes and just let them be themselves. Access to Congress Park is one reason to have a Canfield Casino wedding. As a wedding photojournalist you can ask me to see my Canfield Casino wedding photos from the many past weddings I have photographed there. Planning a fall wedding is often easier as the weather is settled and the heat experienced at summer weddings has passed. Also, with lower humidity, opportunities for your wedding photos are better. Humidity blocks sunlight and the cooler days of a fall wedding mean you’ll get wedding photos with that rich warm sunset glow as the sun goes down later in the day. One of the benefits of a Canfield Casino wedding is that you have direct access to Congress Park. There are many locations in the park just steps from the front door which make great spots for wedding photos. And of course, all of downtown Saratoga Springs can make fun wedding photo locations, day or night. If you’re interested in a different wedding photographer, take a trip through my website to see what I offer. My nontraditional wedding photography appeals to a large number of people who are looking for natural wedding photography and images from their wedding that are authentically and uniquely theirs. You don’t want images from a wedding photo checklist and only those photos. As an award winning Saratoga Springs wedding photojournalist I will cover all of those moments that you’d expect covered at your wedding. But I’ll go so much further. Ready To Get Some Helpful Wedding Planning Information? Just Get In Touch with me today. You won’t get a ton of unsolicited email and I won’t call you at work … I’d love to hear about your wedding day!